An all-out battle issue featuring humans, Domians, Cylons, more Cylons, Apshaidians, and the ever-treacherous Baltar! Picking up from "Hades Hath No Fury", the Domians are phasing out of their stone prisons and attacking the human settlement. The phased bodies of the aliens seem impervious to the laser fire of the Colonial Warriors who attempt to protect the rest of the humans. They realize that the stone monoliths may be the key to subduing the aliens and Sire Obob recklessly grabs the controls of the escape shuttle from Boomer and begins firing at the monoliths, resulting in an explosion that seriously injures Starbuck. Simultaneously, in orbit, Jolly's patrol returns, escorting an alien shuttle carrying a representative of the Cylons' ancient enemy...a member of a surviving population of the original reptilian Cylons! Finally, the humans at the settlement are rescued and return to the fleet, the unconscious Starbuck being immediately placed in a life pod and taken to the life center. Meanwhile, a new command Cylon named Cyrus is brought online at a Cylon recycling facility and a spider-like intruder on the Galactica claims a victim. As the humans are licking their wounds, the Imperious Leader launches his latest attack against the fleet with three basestars and their associated Raider squadrons. During the pitched battle, the Apshaidians, "led" by Baltar, also enter the fray, attacking Cylon and human forces alike with organic technology. Commander Adama decides to pull his forces out of the battle in the hopes that the fleet can escape while the Cylons and Apshaidians are occupied with each other. 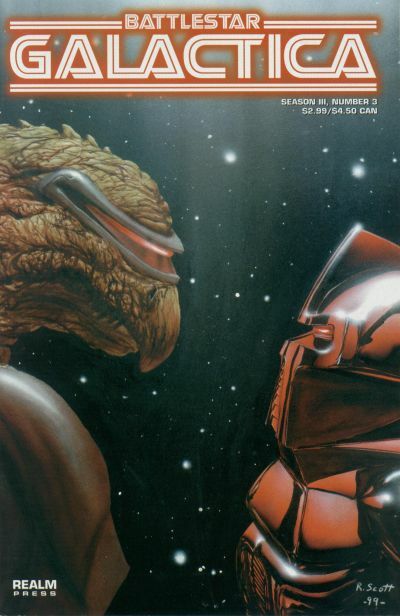 This was the final published issue of Battlestar Galactica: Season III. Realm Press published a few more BSG specials shortly after this and then folded, leaving numerous uncompleted storylines. The stars in between the two figures on Cover A form the constellation of Orion as visible from Earth. Many ancient astronaut theorists believe that the Orion constellation is significant in the symbology of Earth's ancient cultures' (and modern secret societies') connection to extraterrestrial visitors in human civilization's distant past. Page 7 seems to confirm (as hinted at in past TV episodes and novels) that the large afro hairstyle worn by the Imperious Leader is actually a circuitized helmet mounted to his throne. In the early novelizations, it is said he wore a helmet that fed him communications and other data, for processing by his three brains. 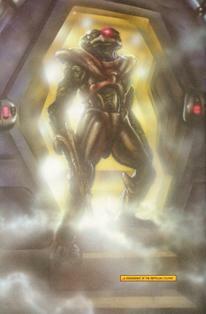 Page 10 gives us our first full look at the original Cylon species in reptilian form. It is similar to the image seen in the BSG TV-movie called Experiment in Terra (a packaging of the BSG episode "Experiment in Terra" and the Galactica 1980 episode "The Return of Starbuck", as well as snippets from other episodes of both series, and a new prelude of an Earth astronaut discovering a written log book from the Galactica, floating through space). On page 13, a centurion is being refitted at a Cylon recycling facility to become one of the gold command Cylons. Upon reactivation, the Cylon announces his name as Centurion Commander Cyrus. "Cyrus" is the name of a Cylon centurion repaired by Starbuck in the later Galactica 1980 episode "The Return of Starbuck" and Starbuck calls him Cy for short; in the episode, Starbuck and Cy become friends (after some initial difficulties). Since the Galactica 1980 series is now considered non-canonical by almost everybody (including creator Glen A. Larson! ), Cyrus' introduction here may be Realm Press' attempt to bring the popular character from the otherwise almost unwatchable sequel series into the "mainstream" BSG universe. A few years prior to this publication, Maximum Press (which had the BSG comic book license at the time) began it's own storyline that seemingly was intended to bring Cy into the mainstream BSG universe (see "The Rebirth of Cy"). In both cases, the stories were never published beyond their initial introductions. On page 22, Cree's Viper is hit by a Cylon Raider during the battle. It's not clear if his ship was destroyed or just damaged. Cree is the cadet who was captured by the Cylons (and later rescued by Apollo's strike team) in "The Gun on Ice Planet Zero" Part 1. As the Apshaidians join the space battle near the end of the issue, we see that their weapons appear to transform the struck portion of the Cylon targets into an organic patch which then spreads and morphs the entire ship and crew into organic versions of themselves, with Apshaidian characteristics. This is somewhat similar to the organic-type attack that IL-series Cylon Belial creates in the form of the nano-cybrid seen in the Cylon Apocalypse mini-series later published by Dynamite Entertainment. 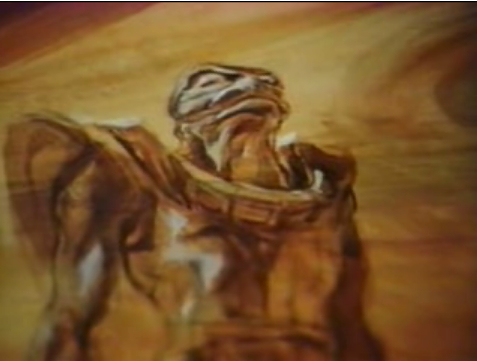 Continuity-wise, it might be argued that Belial based his nano-cybrid on studies of the Apshaidian technology used here.